Globally, breast cancer kills more than half a million women per year. Timely detection can make a drastic difference in survival rates, and ultrasound imaging is gaining popularity in early detection of breast cancer. Portable ultrasound machines are used for routine breast screening as they are inexpensive, readily available, easy to carry, and don’t require any special preparation for the patient. Since ultrasound is real-time, cost-effective, and doesn’t expose patients to unnecessary ionizing radiation, it is the ideal tool for the detection/evaluation of breast lumps or other abnormalities, and for complementing mammography or breast MRI. Ultrasound imaging can also be the primary imaging method for patients who are unable to undergo MRI scans or mammography X-rays due to pregnancy or contraindicated medical conditions. Ultrasound is the recommended modality for imaging dense breast tissue in patients who are at high risk of developing breast cancer. Ultrasound imaging can provide valuable information about the nature and extent of solid masses and other breast lesions; physicians can often use ultrasound images to identify solid abnormalities (such as benign fibroadenoma or cancer) and/or fluid-filled cysts. Point-of-care ultrasound can also be used to guide real-time, minimally invasive breast biopsies, ensuring more accurate tissue samples. It can also help in reducing the unwanted biopsy of simple non-palpable cysts which saves the patient from discomfort associated with it, saves patient’s money. Color Doppler technology (found on SonoSite ultrasound systems for the point of care) is helpful in determining the vascularity of breast lesions, as increased vascularity can signify greater malignancy. 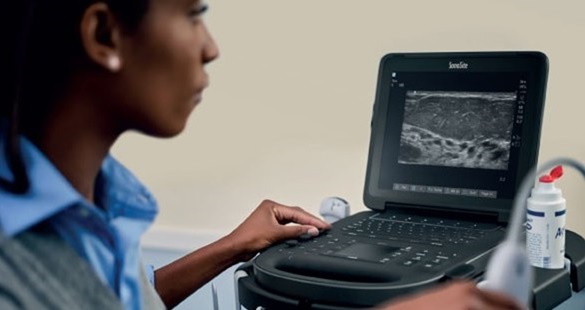 Fujifilm SonoSite manufactures ultrasound systems that are highly durable, light-weight and can be easily carried to the surgery/operating room.The excellent image quality found on our systems can assist physicians indeveloping precise diagnoses. Every new SonoSite ultrasound system is backed by a 5-year warranty, offering peace of mind for your investment. FUJIFILM SonoSite, Inc. will use the information you provide here to communicate with you about FUJIFILM SonoSite, Inc. products and services. Yes, please use the information I provide here to communicate with me about FUJIFILM SonoSite, Inc. products and services. FUJIFILM SonoSite, Inc. the SonoSite logo and other trademarks not owned by third parties are registered and unregistered trademarks of FUJIFILM SonoSite, Inc. in various jurisdictions. All other trademarks are the property of their respective owners.